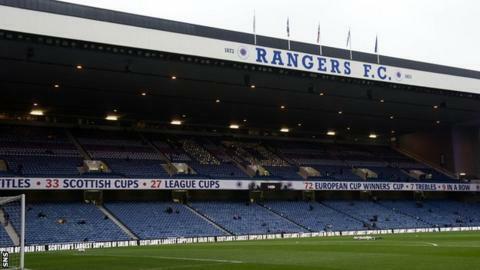 Rangers chief executive Charles Green admits fans are divided over plans to sell the naming rights to Ibrox Stadium. Green is in talks with three potential sponsors, including club shareholder and Newcastle owner Mike Ashley. "Some people are completely against it and no amount of cash would get them to change their mind," Green told the Rangers website. "Other people said, 'is it the right thing and how can we work it out?'" And he added: "Other people I suspect are firmly where I am, that provided we don't denigrate the history of the club, if it brings in cash then that's very important to continue with what we are trying to do and rebuild Rangers." Meanwhile, Green revealed "the club is trading at a loss" but will not make significant cuts. "The normal way would be for a chief executive to take a knife and cut 25-30 per cent of the workforce," he said. "But that's not the actions of a club that are moving and want to go forward. "We will carry this loss because we want to keep the infrastructure. There won't be losses next year and the business will grow and grow."